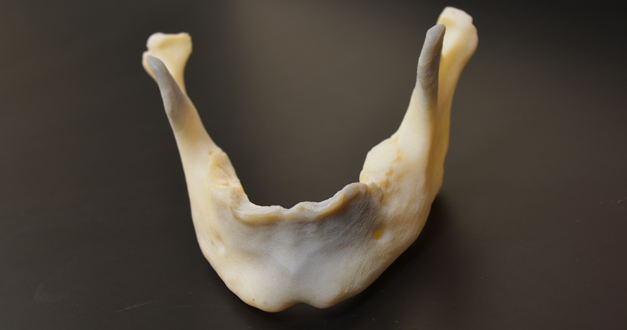 A pre-surgery preparation aid print of a patient-specific lower jaw that is accurately sized and contoured to allow the doctor to properly form the titanium reinforcement that will be screwed into the patient’s jaw. This support acts as a life-time structure for the jaw as a whole and specifically for the bone graft being concurrently performed. The advantage to this process is that it reduces the amount of time the patient has to be in the operating room by 20-30 minutes and allows the surgeon to do the physically hard labor of bending the titanium in advance instead of at a time just before complex microsurgery begins. The objective is to reduce hand fatigue for the surgeon at a critical time in the procedure, reduce overall operating time, and improve outcomes both in better fit of the titanium reinforcement and the risks associated with longer surgical times.